Cameraman Ali Hassan Al Jaber was returning to eastern city of Benghazi from filing report when he was shot and killed. An Al Jazeera cameraman has been killed in what appears to have been an ambush near the rebel-held city of Benghazi in eastern Libya. Ali Hassan Al Jaber was returning to Benghazi from a nearby town after filing a report from an opposition protest when unknown fighters opened fire on a car he and his colleagues were travelling in. Two people including Al Jaber were shot. Al Jaber was rushed to hospital, but did not survive. Al Jazeera’s Tony Birtley, reporting from Benghazi, said Al Jaber was hit by three shots and was wounded through the heart. Wadah Khanfar, the director-general of Al Jazeera, said the network “will not remain silent” and will pursue those behind the ambush through legal channels. He said that the killing came after “an unprecedented campaign” against the network by Libyan leader Muammar Gaddafi. “Al Jazeera condemns the cowardly crime, which comes as part of the Libyan regime’s malicious campaign targeting Al Jazeera and its staff,” the network said in a statement. “Al Jazeera reiterates the assault cannot dent its resolve to continue its mission, professionally enlightening the public of the unfolding events in Libya and elsewhere. Al Jaber, a Qatari national, was born in 1955 and received his bachelor and master’s degrees in cinematography from the Academy of Arts in Cairo. He was the director of CNBC Arabiya TV bureau in Qatar. He also served as a supervisor in the National Olympic Committee between 2002 and 2005 and held the office of Head of Filming Section in Qatar Television for more than 20 years. During his tenure, he produced a number of documentaries including one on Qatar and another on Kuwait entitled “Plight and Tribulation”. His death marks the first report of a journalist killed in the current conflict in Libya. CAÏRO – De Arabische Liga heeft de Veiligheidsraad van de Verenigde Naties gevraagd een no-flyzone boven Libië in te stellen. De 22 landen tellende organisatie – waarvan de ministers van buitenlandse zaken zaterdag spoedoverleg voerden – kan de zone niet zelf instellen, maar goedkeuring betekent de regionale steun die de Verenigde Staten en andere westerse mogendheden nodig zeggen te hebben om het vliegverbod door te voeren. De opstandelingen die de Libische leider Moammar Kadhafi proberen af te zetten hebben ook om de no-flyzone gevraagd. Door een vliegverbod worden ze beschermd tegen luchtaanvallen door de regeringstroepen. Volgens de Amerikaanse regering heeft een no-flyzone echter weinig impact en de internationale gemeenschap is dan ook nog verdeeld over de kwestie. MANAMAH – Tienduizenden mensen zijn zaterdag de straat opgegaan in de Bahreinse stad Safriya. Ze demonstreerden bij een van de paleizen van de koning, een dag nadat een poging om bij een ander paleis te demonstreren op niets uitliep door hard politieoptreden. De naar schatting meer dan dertigduizend betogers riepen leuzen tegen het regime van koning Hamad bin Isa al-Khalifa. Volgens getuigen was er dit keer nauwelijks politie op de been. SANAA, Yemen – Yemeni security forces killed six people Saturday and wounded hundreds in the second day of a harsh crackdown on anti-government protests, witnesses said. One of the dead was a 15-year-old student. The assault with gunfire and tear gas was the toughest yet by the Yemeni government in a month of protests aimed at unseating President Ali Abdullah Saleh, who has been in power for 32 years. The violence began with a pre-dawn raid on a central square in the capital, Sanaa, where thousands of pro-democracy protesters have been camped out. Doctors and eyewitnesses said security troops surrounded the square with police cars and armored personnel carriers shortly after midnight and began calling on protesters through loudspeakers to go home. At 5 a.m., security forces stormed in, firing live and ammunition tear gas. One protester died from a bullet to the head, which may have come from a sniper on the rooftop of a nearby building, witnesses said. Abdelwahed al-Juneid, a volunteer doctor working with the protesters, said around 250 people were wounded. A few hours later, another protester was shot dead in a nearby street. Eyewitnesses said he was also killed by a sniper, but that could not be independently confirmed. Security officials did not have any immediate comment. In the city of Dar Saad in the southern province of Aden, police used live fire and tear gas to disperse a crowd of several thousand, killing three demonstrators, a local activist and a hospital official said. They spoke on condition of anonymity because of the tense situation. The hospital official said all the dead were all shot in the head. Eleven other protesters were wounded, he said. The activist said the protesters later marched to the local police station, demanding that the shooter be handed over. Then they burned down the police station, the witness said. In the port city of Mukalla in the southeastern province of Hadramout, a 15-year-old student was shot dead when security troops opened fire on protesters. Twelve people were wounded in similar violence in Yemen’s southern province of Taiz. Saleh, an ally in the Obama administration’s fight against al-Qaida, appeared to be one of the Arab leaders most threatened by the regional unrest inspired by pro-democracy revolts in Egypt and Tunisia. Demonstrators are demanding jobs and greater political freedoms. Saleh has tried to calm protesters by proposing that the government create a new constitution guaranteeing the independence of parliament and the judiciary — but protesters have said it’s too little, too late. Saturday’s raid on the Sanaa square came after Yemen’s largest demonstrations in a month Friday were met by police gunfire that injured at least six protesters. Hundreds of thousands of protesters gathered in Yemen’s four largest provinces, ripping down and burning Saleh’s portraits in Sheikh Othman, the most populated district in the southern port city of Aden, witnesses said. In the capital, thousands of women participated in demonstrations — a startling move in a deeply tribal society where women are expected to stay out of sight. By Friday evening, protesters in Sanaa had expanded the area of their sit-in encampment, further angering authorities and leading to clashes with plainclothes security men. Protesters said the men were carrying sticks, knives and iron rods. Four protesters were injured, witnesses said. Yemen was chaotic even before the demonstrations began, with a resurgent al-Qaida, a separatist movement in the south and a sporadic Shiite rebellion in the north vexing the government, which has little control outside major urban areas. TUNIS – Tunisia’s interim government on Saturday refused to legalize five political parties, including three Islamic ones — the first such rejections since the country’s longtime autocrat was driven from power. The Interior Ministry ruled the applying parties didn’t adhere to a law requiring parties to be organized democratically and banning those created on the basis of religion, ethnicity, gender or region, the official news agency TAP reported. The caretaker government has faced a delicate task in fostering democracy after President Zine El Abidine Ben Ali fled to Saudi Arabia in January amid massive street protests — especially because laws from his era remain on the books until a new constitution can be devised. The religious parties denied legalization were the Assalam, or Peace, party; a Sunni Muslim party; and Hizb Ettahrir, or the Liberation Party — a movement with historic ties to the Egypt-based Muslim Brotherhood. At a news conference Saturday, Ridha Belhaj, a spokesman for Hizb Ettahrir, said his party wants a regime based on sharia law and doesn’t rule out “rebellion and civil disobedience” to create an Islamic state. The government did approve the applications of three other political parties, bringing the total now legalized to 34 — up from only nine under Ben Ali’s regime. It dissolved his former ruling party, the RCD, on Wednesday. Separately Saturday, TAP reported that Tunisian authorities have arrested three close allies of Ben Ali. Abdallah Kallel, Abdelaziz Ben Dhia and Abdelwaheb Abdallah were detained on suspicion of illegally obtaining money and other alleged crimes as part of a crackdown against the Democratic Constitutional Rally, or RCD. The three men had previously been under house arrest, and were remanded into remanded in custody after appearing before an investigating judge, TAP said. The government has been struggling to build new political institutions to replace bodies dominated by Ben Ali and the RCD — including the two houses of parliament. Elections are planned July 24 for a body that will devise a new constitution, a step toward new legislative and presidential elections. BENGHAZI, Libya (AFP) – Several thousand Libyan women marched through the streets of rebel-held Benghazi on Saturday, demanding a no-fly zone to stop Moamer Kadhafi from bombing rebel fighters. “No-fly zone! No-fly zone!” chanted the crowd in English and in unison, waving Libyan flags and flashing victory signs as they marched along the seafront corniche in the country’s rebel-held second city. Students, mothers, grandmothers, children and toddlers walked hand in hand, most of them wearing headscarves and some with flags painted on their cheeks and Libyan flags wrapped around their foreheads, bandana-style. One demonstrator held up a poster depicting Kadhafi as a vampire, with fangs, fuzzy hair, blood dripping from his mouth and a pirate’s eyepatch. “We want a no-fly zone because we are dying, we are dying, we are dying. We need help from the UN,” shouted one woman in a headscarf. “We don’t want foreign intervention, we just want a no-fly zone and our boys will do the rest. But they have light weapons in the face of air strikes,” said Nada el-Turki, an economics student walking hand in hand with a toddler. At the beginning of the protest, witnesses said a man tried to ram the march with a car stocked with grenades, but was detained by volunteer guards, some of whom were carrying rifles and one a rocket-propelled grenade. An AFP reporter saw a car with its windscreen smashed in. 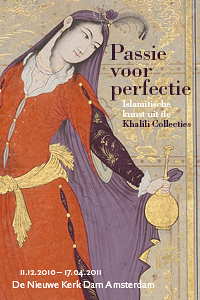 In De Nieuwe Kerk Amsterdam is momenteel de tentoonstelling Passie voor perfectie te zien, een tentoonstelling met islamitische kunst uit de privécollectie van Dr. Nasser D. Khalili. In het kader van deze tentoonstelling heeft De Nieuwe Kerk het project Islam Nu gelanceerd. Voor dit project hebben wij vier verrassende smaakmakers uitgenodigd. Tarik Yousif, Naema Tahir, Funda Müjde en Bright O. Richards gaan onder leiding van change agent Kirsten van den Hul ieder op eigen wijze het gesprek aan. Welke rol speelt religie vandaag de dag? En wat kunnen we ermee? Met film, literatuur, theater en het woord levert Islam NU een bijdrage aan de dialoog over geloof en samenleving. Er worden in totaal acht bijeenkomsten georganiseerd. Vier in De Nieuwe Kerk Amsterdam en vier op locaties elders in het land.